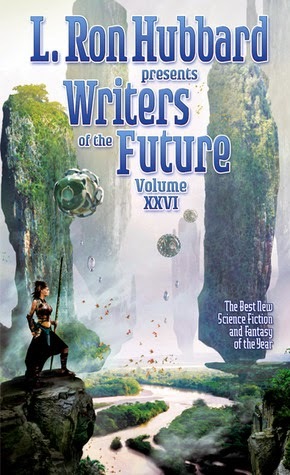 Writers of the Future Volume 26 is available at Amazon, Barnes and Noble, and BooksAMillion. Discover Imaginative New Worlds of Tomorrow. Discover the new visionaries of imagination in the Writers of the Future. Established in 1983 by L. Ron Hubbard expressly for the aspiring writer, Writers of the Future has become the most respected and significant forum for new talent in all aspects of speculative fiction. Never before published first-rate science fiction and fantasy stories selected by top names in the field. I avoided this series for a long time because L Ron Hubbard's religious cult scares me. Then, I received two volumes (29 and 30) in exchange for reviews and now, I'm reading the series backwards. This volume of the anthology has been my least favorite to-date simply because I didn't understand a couple of the stories. Too much was left for me to infer. On the other hand, Not In the Flesh by Adam Colston has been one of my favorite stories that I've seen in this series (and is by favorite story in this volume). And, since I love the exposure to new writers, I've already purchased Volume 25.